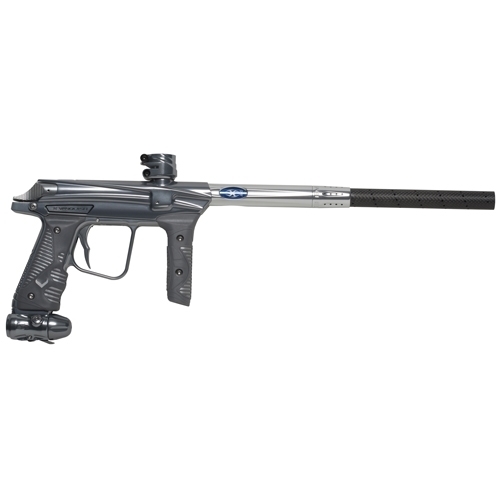 - The Empire Vanquish uses a pressure balanced spool valve transformed to reduce first shot drop off and increase efficiency. The result is a smooth and quiet shot that is unmatched by any other marker in the industry. OLED and USB interface - Super bright and really big. The OLED screen is easily seen in direct sunlight and the 5-point joystick allows you to make any changes needed on the fly. If you want to get more in-depth, the USB interface (PC and Mac Friendly) is for you. Settings can be changed using the Empire Vanquish software with just a push of the button. Customize your boot screen, dwell, ROF, and many other settings from your computer chair. - Gone are the days of getting shot in the huge gauge on the side of your marker. We've added a digital pressure transducer to give your hyper-accurate readings to ensure your Vanquish is shooting at the perfect setting. - Clean and lube your Pressure Balanced Spool Valve Engine in a matter of seconds. The Push-Button Bolt Removal System was made popular with the Empire AXE and we decided to carry it over on our Vanquish platform. - Access your USB port with only one hex key. - That is all you need. We've made it easy for you, that one hex key takes care of every screw on the Vanquish. Cleaning and maintaining your marker has never been easier.